The 14kt yellow gold Songs of Life ring is set with four genuine 6mm x 3mm marquise gemstones. Five 1.3mm round cubic zirconia accent stones. 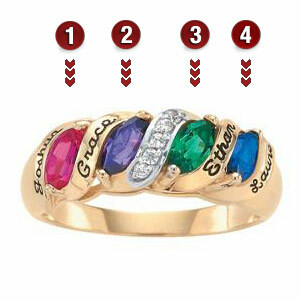 Engraving areas 1, 2, 3 and 4 accommodate up to 10 characters, including spaces and punctuation. Import. This ring is absolutely stunning! It is so beautiful and even more than I expected. The stones are large enough to see even from a distance. It is very comfortable to wear.